2008 was a busy, if tumultuous year for the Flash. 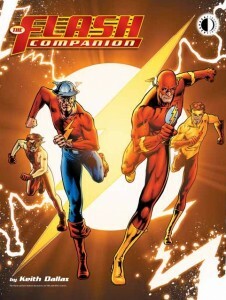 As 2008 opened, the Flash was just wrapping up the six-part story “The Wild Wests,” the relaunch featuring Wally West as head of the Flash family and introducing his super-powered twins, Iris and Jai. 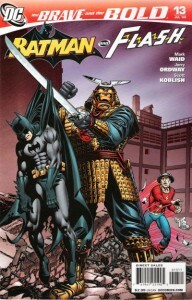 To put it mildly, it was not received well by fans, and former fan favorite writer Mark Waid quickly left the book. After a one-shot by Keith Champagne, Tom Peyer picked up the regular writing chores and Freddie Williams II stayed on for the 6-part “Fast Money,” which resolved the twins’ super-speed aging problem and gave us a glimpse of an adult Iris West II. The series wrapped up with the year, as Alan Burnett, Paco Diaz, and Carlo Barberi brought us “This Was Your Life, Wally West.” The four-part story arc looked back at Wally West’s career as Kid Flash, then the Flash, and his relationship with his wife Linda and their children. The Rogues’ Gallery were off-limits to start with, as they were off-planet for Salvation Run. Early in the year, DC released the news of Flash: Rogues’ Revenge, a miniseries that would spotlight them after they returned to Earth, going after Inertia for tricking them into killing the Flash. Geoff Johns and Scott Kolins would return to the speedster mythos for six issues. 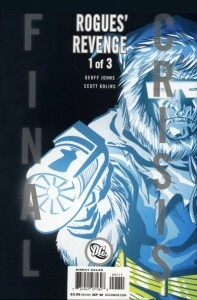 By the time the series was launched, it had become Final Crisis: Rogues’ Revenge, and instead of six regular-sized issues it was three oversized issues. Just one month later, at Comic-Con International in San Diego, DC announced the upcoming miniseries, Flash: Rebirth, by the Green Lantern: Rebirth team of Geoff Johns and Ethan Van Sciver. The series is currently scheduled to start in April 2009. See also: what we know so far about Flash: Rebirth. Jay Garrick continued to appear regularly in Justice Society of America. He also teamed up with Batman in The Brave and the Bold #13, as they battled a nearly-forgotten villain from the late Silver Age: the Samuroids. Wally West started appearing in the newly-launched Titans series. After a conspicuous absence in Justice League of America, he shared the spotlight with Wonder Woman for issue #20, as they went up against Queen Bee — the same villain who would headline the final story arc in this volume of The Flash. Wally also made several appearances in Brave and the Bold. While his spotlight issue was released in 2007, he appeared as one of the original Teen Titans in a flashback story in issue #10, and in the present day in #12. Speaking of flashbacks, Teen Titans: Year One looked back at the formation and early days of DC’s main teen super-team. 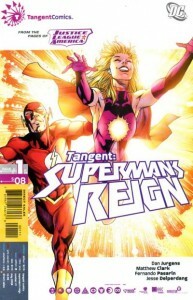 And then there’s the 12-part Tangent: Superman’s Reign, which started in March. 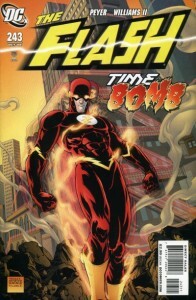 Wally West shared the first cover with the Tangent Universe’s Flash, Lia Nelson, and both Flashes have continued to play a role in the story. Just about everyone has shown up in Trinity at one point or another, and of course in Final Crisis. Outside the DCU, the Flash has appeared in Super Friends and Kid Flash in Tiny Titans. 2008 started with a second edition of Blood Will Run, the first story arc Geoff Johns wrote as the regular Flash writer (with Wonderland he’d been hired just for the one arc), which added the graphic novel, Iron Heights. The second volume of Showcase Presents:The Flash arrived in June, reprinting more of Barry Allen’s Silver-Age adventures in a cheap, black-and-white collection. In February, Barry Allen appeared in the direct-to-DVD animated film, Justice League: The New Frontier (reviewed on my other blog), based on Darwyn Cooke’s DC: The New Frontier. The movie debuted at WonderCon in San Francisco the weekend before its release. 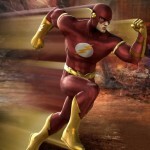 In March, the Flash appeared in the two-part series finale of The Batman, “Lost Heroes,” alongside the Justice League. Season 5 was released on DVD in July, and reviewed here earlier this week. Teen Titans Season 5, which featured Kid Flash in several episodes, was also released on DVD in July. The DVD set DC Superheroes: The Filmation Adventures was released in August, featuring (among others) the Flash and Teen Titans segments from the 1967 Superman/Aquaman Hour of Adventure. They’re certainly a different take on the heroes. Meanwhile, a number of DC-based cartoons and TV series including Superfriends, the live-action Flash TV series the Filmation cartoons and others have been made available as digital downloads from such services as iTunes, Amazon Video on Demand, and XBox Live. This summer, word came out that the Flash would appear in Mortal Kombat vs. DC Universe. The game was released to mixed reviews in November. Back at Comic-Con in July, Sony previewed the upcoming massively-multiplayer online game, DC Universe Online. At least two Flashes (Jay Garrick and either Wally West or Barry Allen) appear in the game, which is being scripted by Geoff Johns and will likely ship in late 2009 or early 2010. In July, just in time for Comic-Con, TwoMorrows released The Flash Companion. 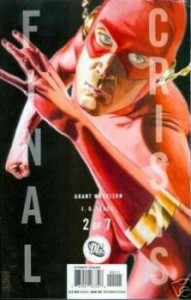 The 224-page book covers the full behind-the-scenes history of the Scarlet Speedster, from his origins in the 1940s to the present day. The biggest part of the book is dedicated to interviews with and articles about the writers, artists and editors who have brought the character to life for the past seven decades. In addition to the interviews, there’s previously unpublished artwork, articles about unusual facts — like the time one editor ordered two covers for the same issue, or the unused Flash — and of course, Rogue Profiles. I’m still excited about this one because I contributed several of the character profiles — specifically, the ones for Abra Kadabra, Professor Zoom, and Zoom. 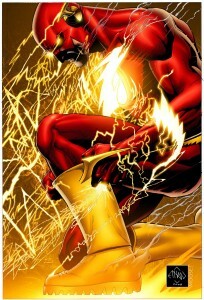 So what’s coming up for the Flash in 2009? That’s the subject for another post, and I’ll have it ready for you…next year! Thanks to the Grand Comics Database for several of the covers. This entry was posted in General and tagged Alan Burnett, Barry Allen, Collections, Final Crisis, Flash Companion, Flash: Rebirth, Freddie Williams II, Geoff Johns, Mark Waid, MK vs DC, New Frontier, Rogues Revenge, San Diego, Scott Kolins, SDCC 2008, Tangent, The Batman, Tom Peyer, Wally West on December 30, 2008 by Kelson. It was a pretty tumultuous year for the Fastest Men live, but all in all I have to say, it was a good one. With Wally, Linda, and the kids having adventures in the main title, Barry coming back, Jay playing the awesome elder statesman, Rogues’ Revenge showcasing the baddies, plus the release of both Showcase Presents: The Flash V.2 and the Flash Companion really add up to a very good year! I don’t think Keith Champagne’s done-in-one was given enough props. It was a great little story, and I hope he gets to write most of the West family in the future.